Attorney Michael Avenatti has been arrested and charged with federal crimes on both coasts. The bombastic lawyer was taken into custody Monday morning in Manhattan for attempting to extort upwards of $20 million from Nike by accusing them of illegally funneling money to college and high school basketball recruits. Avenatti has also been charged with wire and bank fraud in California for embezzling a client’s money and defrauding a bank with fake tax returns. According to the U.S. Attorney’s office in the Southern District of New York, Avenatti told Nike that he would not go forward with the press conference if they agreed to pay him $15-20 million to retain his legal services for an internal investigation. As a result, he has been charged with extortion, conspiracy to commit extortion, transmission of interstate communication with intent to extort, and conspiracy to transmit interstate communication with intent to extort. The Wall Street Journal reports that celebrity lawyer Mark Geragos was Avenatti’s co-conspirator in the extortion scheme. Geragos has represented celebrities in several high-profile cases in the past, including Michael Jackson, Chris Brown, Winona Ryder and, most recently, Jussie Smollett. No charges have yet been filed against Geragos as of this writing. Meanwhile, the U.S. Attorney for the Central District of California Nicole T. Hanna announced on Monday that Avenatti could face up to 50 years in prison for embezzling a client’s money to pay off his own debts and defrauding a bank in Mississippi with fake tax returns in order to secure a loan worth over $4 million. The extortion and fraud cases are reportedly unconnected, but the authorities in both states coordinated their search and arrest warrants to land at the same time. 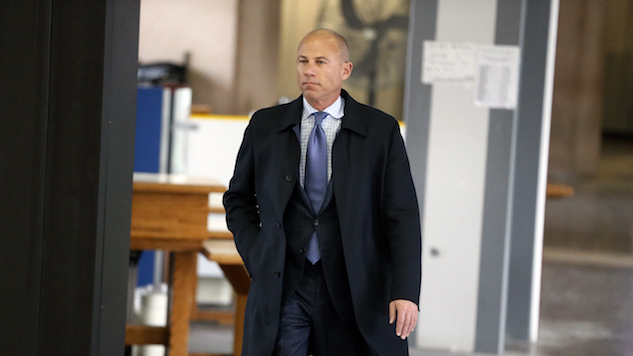 Avenatti entered the spotlight as the attorney for adult film star Stormy Daniels in her lawsuits against President Trump in 2018. Since then, he has represented one of the women who came forward to accuse Supreme Court Justice Brett Kavanaugh of sexual misconduct and assault, briefly considered running for president in 2020, and been arrested but not charged for domestic violence against his girlfriend. No information is yet available about when he will stand trial for these latest charges.